Over the last day, Russia-backed militants made forty-two attacks upon the Ukrainian troops’ positions, forty-one of them were precision attacks. “The enemy used weapons proscribed under the Minsk agreements. 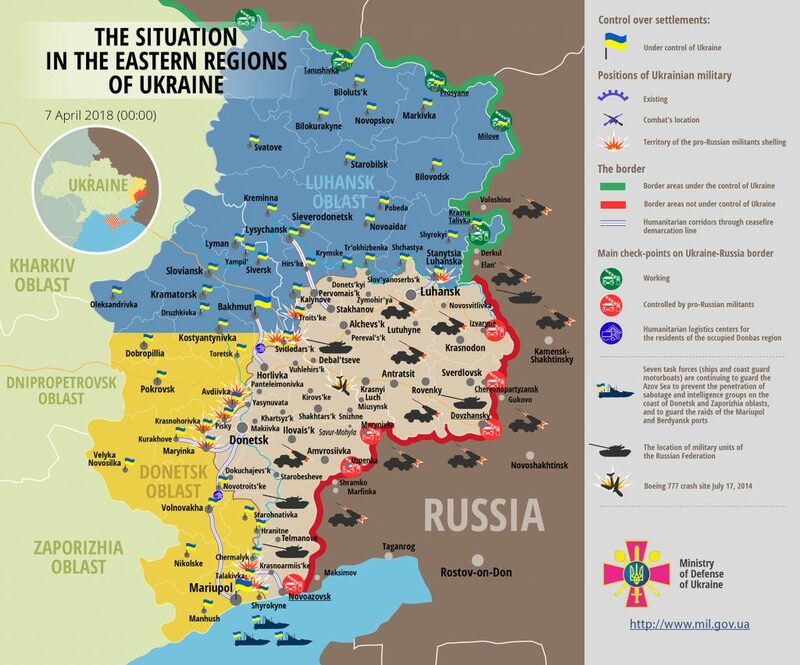 Unfortunately, two Ukrainian servicemen were wounded in action”, reported Ukrainian Ministry of Defense spokesman Colonel Dmytro Hutsulyak at a press briefing at Ukraine Crisis Media Center. Russian proxies fired twenty-one 82-mm mortar rounds, fourteen 120-mm mortar rounds. Moreover, they used one 122-mm artillery shell. Ukrainian troops had to return fire in 18 cases. In Luhansk sector, the enemy delivered ten attacks against Ukrainian troops. In Troitske area, Russia-backed militants fired four times. In Valuyske and Luhanske areas, Russian proxies fired fourteen 120-mm mortar rounds. “The enemy attacked Ukrainian positions near Troitske, Luhanske and Novoluhanske using 82-mm mortars, large caliber machine guns, grenade launchers and IFVs”, elaborated Col. Hutsulyak. In Donetsk sector, Russian proxies attacked Ukrainian troops thirty-two times. “Russia-backed militants used small arms, large caliber machine guns and grenade launchers. In Pisky area, the enemy attacked Ukrainian position using 82-mm mortars. Russian proxies fired five mortar rounds”, Colonel Hutsulyak said. Russia-backed militants fired one 122-mm artillery shell near Shyrokyne. Moreover, the enemy made precision attacks near Hnutove, Kamianka, Krasnohorivka, Lebedynske, Shyrokyna and Shakhta Butovka. Report on the military developments as of April 6 is available here. Interactive data on the shelling: chronology shelling chart and the interactive map.